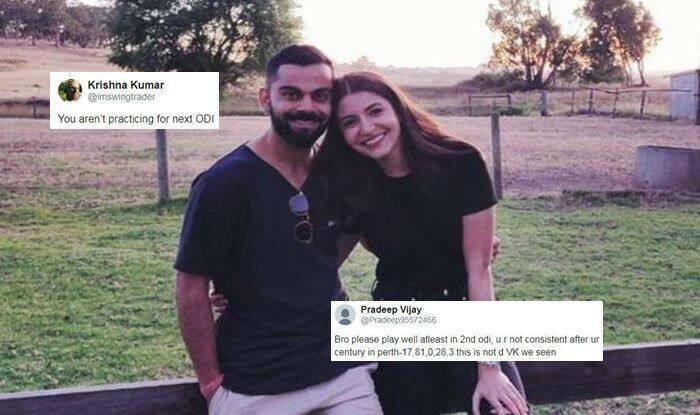 2nd ODI: India skipper again got trolled after he posted a picture of him along with his wife having some 'we' time in Adelaide ahead of the 2nd ODI. 2nd ODI: India skipper again got trolled after he posted a picture of him along with his wife having some ‘we’ time in Adelaide ahead of the 2nd ODI. Fans seem to be concerned over his current form as it is nowhere close to his best. With him being the best batsman on the planet, the stakes are always high when he walks out to bat. Kohli was dismissed for merely three runs in the first ODI which India lost by 34 runs to allow hosts Australia take a 1-0 lead. Fans want Kohli to get among the runs in the 2nd ODI as it is extremely important from India’s point of view. If India loses, they lose the three-match ODI series and Kohli would be mindful of that. With series on the line, the Indian captain looked focussed as ever and was caught by the camera while putting in all the efforts during the nets session on Monday.